It inhabits freshwater marshes and swamps, often with tall reeds, as well as mangroves. In the Caribbean, it also inhabits dry brushland. In Mexico and northern Central America, it occurs at altitudes up to 1,500 m (4,900 ft). 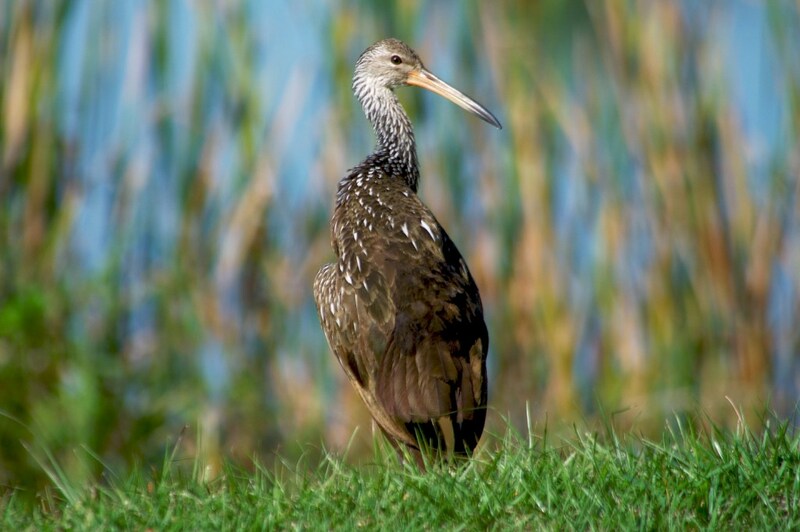 The Limpkin is a somewhat large bird, 66 cm (26 in) long, with a wingspan of about 102 cm (40 in) and a weight of about 1.1 kg (2.4 lb). Its plumage is drab—dark brown with an olive luster above. The feathers of the head, neck, wing coverts, and much of the back and underparts (except the rear) are marked with white, making the body look streaked and the head and neck light gray. It has long, dark-gray legs and a long neck. Its bill is long, heavy, and downcurved, yellowish bill with a darker tip. The bill is slightly open near but not at the end to give it a tweezers-like action in removing snails from their shells, and in many individuals the tip curves slightly to the right, like the apple snails’ shells. The white markings are slightly less conspicuous in first-year birds. Its wings are broad and rounded and its tail is short. It is often confused with the immature White Ibis. This bird is easier to hear than see. Its common vocalization is a loud wild wail or scream with some rattling quality, represented as “kwEEEeeer or klAAAar.” This call is most often given at night and at dawn and dusk. It has been used for jungle sound effects in Tarzan films and for the hippogriff in the film Harry Potter and the Prisoner of Azkaban. Other calls include “wooden clicking”, clucks, and in alarm, a “piercing bihk, bihk…”. Because of their long toes, they can stand on floating water plants; they also swim well. They fly strongly, the neck projecting forward and the legs backward, the wings beating shallowly and stiffly, with a jerky upstroke, above the horizontal most of the time. forage primarily in shallow water and on floating vegetation such as water hyacinth and water lettuce They walk slowly with a gait described as “slightly undulating” and “giving the impression of lameness or limping”, “high-stepping”, or “strolling”, looking for food if the water is clear or probing with the bill. They feed on small aquatic life, principally apple snails. The availability of this one mollusk has a significant effect on the local distribution of the Limpkin. 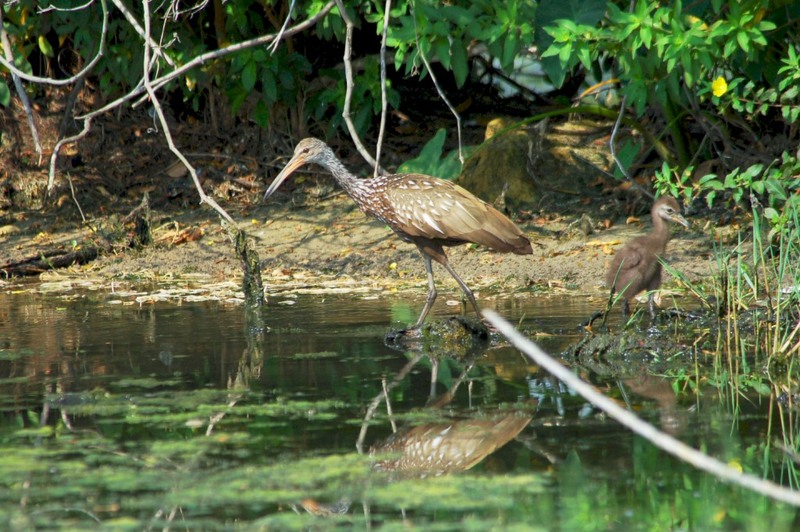 When a Limpkin finds an apple snail, it carries it to land or very shallow water and places it in mud, the opening facing up. It deftly removes the operculum or “lid” and extracts the snail, seldom breaking the shell. The extraction takes 10 to 20 seconds. It often leaves piles of empty shells at favored spots. Freshwater mussels are a secondary food source. Less important prey items are land snails, insects, frogs, and lizards. Males have territories of several hectares, where they call loudly and chase other males away. Nests are built on the ground, in dense floating vegetation, in bushes, or at any height in trees. They are bulky structures of rushes, sticks or other materials. The clutch consists of 5 to 7 eggs, averaging 6, which measure 6.0 cm × 4.4 cm (2.4 in × 1.7 in). Their background color ranges from gray-white through buff to deep olive, and they are marked with light-brown and sometimes purplish-gray blotches and speckles. Both parents incubate for about 27 days. The young hatch covered with down, capable of walking, running, and swimming. 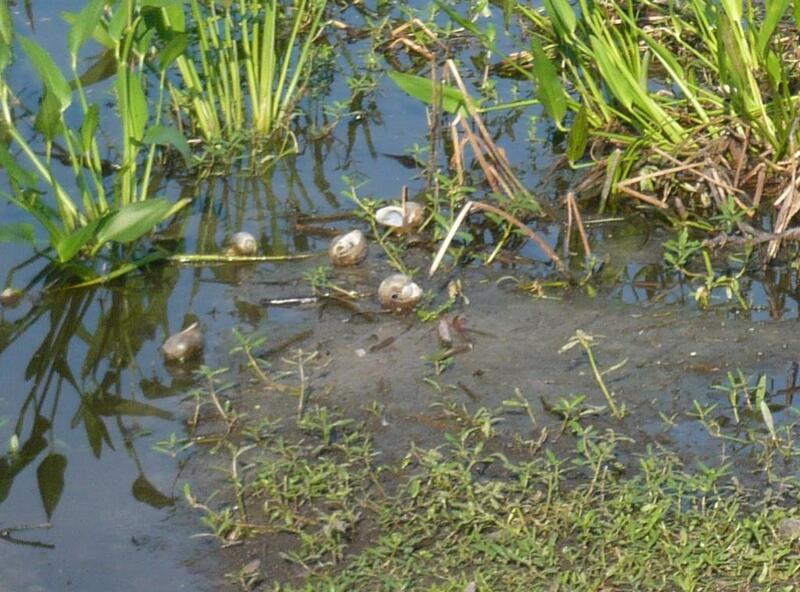 They follow their parents to a platform of aquatic vegetation where they will be brooded. They are fed by both parents; they reach adult size at 7 weeks and leave their parents at about 16 weeks.